Summit Power International Limited (“SPI” or the “Group”), the largest independent power producer in Bangladesh, today announced that Summit Corporation Limited, a subsidiary of Summit Power International along with Summit Holdings Limited, Mitsubishi Corporation (“Mitsubishi”) and its subsidiary Diamond Gas International Pte. Ltd. have signed a Memorandum of Understanding (“MOU”) to develop a LNG-to-Power project at Matarbari, Moheskhali area in Bangladesh, which is expected to cost up to US$3 billion. The signing of the MOU was witnessed by the Honorable Prime Minister Sheikh Hasina of Bangladesh and Singapore’s Minister for Trade and Industry (Trade) Mr Lim Hng Kiang at the Bangladesh-Singapore Business Forum 2018. Under the MOU, the parties agreed to develop an integrated liquefied natural gas (“LNG”) on shore receiving terminal with a regasification capacity of up to 1,500 million cubic feet per day (“mmcfd”), two units of 1,200 megawatt (“MW”) gas turbine combined cycle power projects (total of 2,400 MW), relevant high voltage transmission lines and the import of LNG. 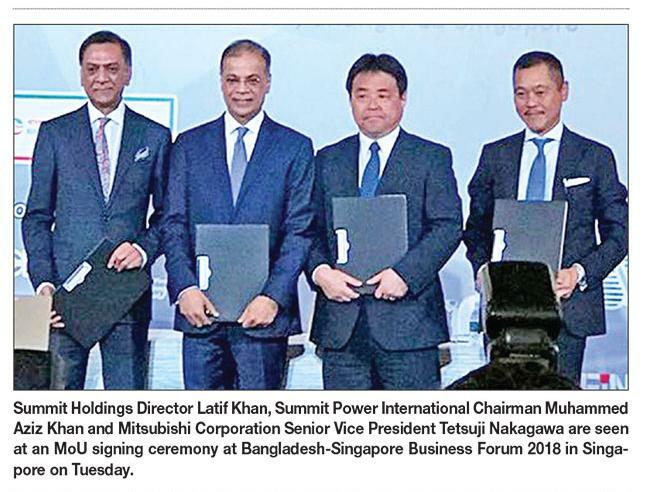 Incorporated in Singapore, Summit Power International (“SPI”) is a leading developer, owner and operator of high-quality power projects in Bangladesh. Having co-sponsored Bangladesh’s first independent power plant in 1997, SPI is the largest independent power producer in the country, representing approximately 21% of the private power market in 2017. At SPI, our business is underpinned by our values of improving the quality of lives by providing the most needed infrastructure. As the recipient of the Best Power Generation Project Award in Bangladesh for four consecutive years (2013 to 2016), we have extensive experience and a proven track record in successfully developing, constructing and operating power assets. For more information, please visit https://summitpowerinternational.com/.